On Monday, May 21, Rear Admiral Paul Becker, USN (Ret), a combat veteran and inspirational Stage IV Cancer Survivor, will keynote at the Excellence In Healthcare (EIH) Conference (http://www.eihconference.com) in Charleston, SC. Passionate about improving “The Patient Experience,” Paul (https://TheBeckerT3Group.com) will discuss the value of applying the military leadership lessons of “Teamwork, Tone and Tenacity” to enhance Healthcare Performance, Productivity and Quality of Care. Passionate about improving The Patient Experience, Rear Admiral Becker will discuss the value of applying the military leadership lessons of “Teamwork, Tone and Tenacity” to help overcome extreme adversity, enhance Healthcare Performance, Productivity and Quality of Care. 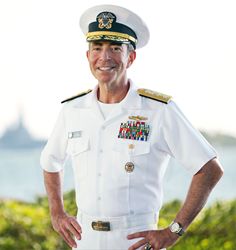 On Monday, May 21, Rear Admiral Paul Becker, USN (Ret), a combat veteran and inspirational Stage IV Cancer Survivor, will keynote at the Excellence In Healthcare (EIH) Conference (http://www.eihconference.com) in Charleston, SC. Passionate about improving “The Patient Experience,” Paul (https://TheBeckerT3Group.com) will discuss the value of applying the military leadership lessons of “Teamwork, Tone and Tenacity” to enhance Healthcare Performance, Productivity and Quality of Care. A principle theme of this year’s multi-day EIH Conference is “A Return to Purpose: Restoring Relationships in Healthcare.” Several hundred Clinicians, Administrators and medical thought leaders from across the United States will attend. About The Becker T3 Group: Founded in 2016 and based in Alexandria, VA, The Becker T3 Group (https://TheBeckerT3Group.com) is a Service-Disabled, Veteran-Owned Small Business (SDVOSB) Consultancy with specialization in Motivational Keynote Speaking, Executive Leadership Training and Coaching for healthcare and business audiences. Its Founder and CEO, Rear Admiral Paul Becker, USN (Ret), served for 30 years as a Naval Intelligence Officer in peace, crisis and combat. Paul is an inspirational Bone Marrow Cancer survivor dedicated to enhancing Quality of Care by applying the military leadership attributes of "Teamwork, Tone, Tenacity (T3)” to improve the Healthcare community’s pillars of Performance, Productivity and the Patient Experience.